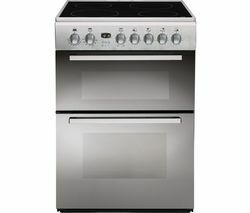 Explore our range of freestanding gas and electric Indesit cookers. With ceramic or gas hobs as well as self-cleaning technology, they make it easy to complete your ideal kitchen. Affordable and reliable, the Indesit cooker range is available in a selection of styles, sizes and finishes to suit your home and cooking needs. Get the best of both worlds with a dual fuel Indesit cooker, offering you the instant temperature control of a gas hob with the energy efficiency, even cooking temperature and multifunction capabilities of an electric oven. 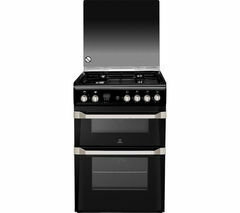 Choose from electric, fan and multifunction double ovens, with or without grills, as well as the choice of single or double ovens to give you all the capacity you need. Double oven Indesit cookers give you more versatility in the kitchen, and an overall cooking capacity of up to 113 litres - perfect for big family Sunday roasts. Choose from 2- or 4-burner gas hobs that give you instinctive temperature control, or opt for the convenience of a ceramic hob. Electric hobs use induction technology to only emit heat when in contact with your pots and pans, ensuring safe, energy-efficient cooking. Different sized zones mean you can pick the best option for your pans. Every zone offers safe and consistent heat at the turn of a dial. Seamless design also means that it's easy to clean your hob surface with just one wipe, for a tidy looking kitchen. Indesit ovens are simple to keep clean too, thanks to steam cleaning and catalytic self-cleaning options. Steam cleaning models use steam to dislodge any grease and cooked-on food, while catalytic liners use high heat to break down grease and fat so you spend less time and effort cleaning. Some Indesit cookers also come with a built-in splashback, protecting your kitchen walls from spills and grease. Choose from white, black, stainless steel, mirrored and red finishes to complement your kitchen. To complete your cooking set up, view our range of cooker hoods designed to match the cooker of your choice, for a neat kitchen look.